This outing is turning into a Sailing Club tradition. Summers are always fun here in New Jersey and our own Barnegat Bay is a sailor's delight. Our plan is to reserve two boats for Sunday, July 8 with Barnegat Bay Sailing School (BBSS) located at Cedar Creek Marina, 100 Harbor Inn Rd., Bayville, NJ. We will do the morning sail, arriving by 9:30 am latest for the 10 am dock departure with captains Mike and Audrey. 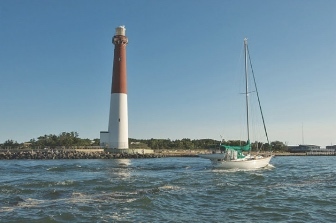 A family-friendly sail of 2.5 hours out in Barnegat Bay with an experienced local captain is a great way to get an introduction to what sailing is all about. It's a perfect trip of those new to sailing or anyone looking for a pleasant summer day with great people! Lots of opportunity to take the wheel, assist with sails, learn about the bay...and children over age 6 are welcome. All children under 13 will be required to wear a life jacket while on the boat. Life jackets will be supplied, but you are welcome to bring your own. Boats are a Catalina 30 and a Pearson 37. There are nice restrooms at the marina for your use before boarding. We anticipate returning to the marina about 12:30 pm and then head over to the The Cove Bar & Grill just down the road from the marina for a group lunch and share stories of the afternoon. There is a patio and live music, if we stay late enough. As we did last year, if enough people sign-up, we will add an afternoon sail. Whether you're an experienced skipper, or have never set foot on a boat, this will be a great opportunity to socialize, learn new techniques, hear new stories, and just have a few laughs. The cost of the day sail is $50.00 per person. The price includes boat rental for two and a half hours, water, soda and snacks while on board, provided by BBSS. You are free to bring your own as well. Further details will be announced in April when the BBSS is back in session and issues their 2018 schedule. The Club's standard 30 day cancellation policy applies. Please make your check payable to The Sailing Club, Inc. and mail it, along with your completed reservation and Release form, to Rudy Vallejo at the address on the form. Anyone under the age of 18 must be accompanied by a parent or guardian and have Release Form for Minors completed. Reservations are on a first come, first served basis. Reservations must be received by July 1st. However, if your schedule changes at the last minute and you'd like to join us, please reach out to me as we may be able to accommodate you.